It was a big night out last night for all of the celebrity moms in LA. Author Jessica Denay, debuted her new book “The Hot Mom To Be Handbook: Womb With A View”.In attendance were many expectant moms including Elisabeth Röhm, Jodie Sweetin and Busy Philips. Trista and Ryan brought Max and Brooke Burke arrived with her 2 oldest girls Neriah, 8 and birthday girl, Sierra, who was 6 yesterday. 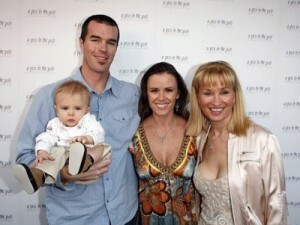 The Biggest Loser host Allison Sweeney brought her son Benjamin, 2, and Melissa Joan Hart showed of new baby Braydon.